Unwelcome Surprise: The Chiggers That Spread Scrub Typhus Are Not Just In Asia And Australia : Goats and Soda The mite larvae that transmit scrub typhus were thought to live only in parts of Asia and Australia. Now three cases have been reported on an island off Chile's coast. 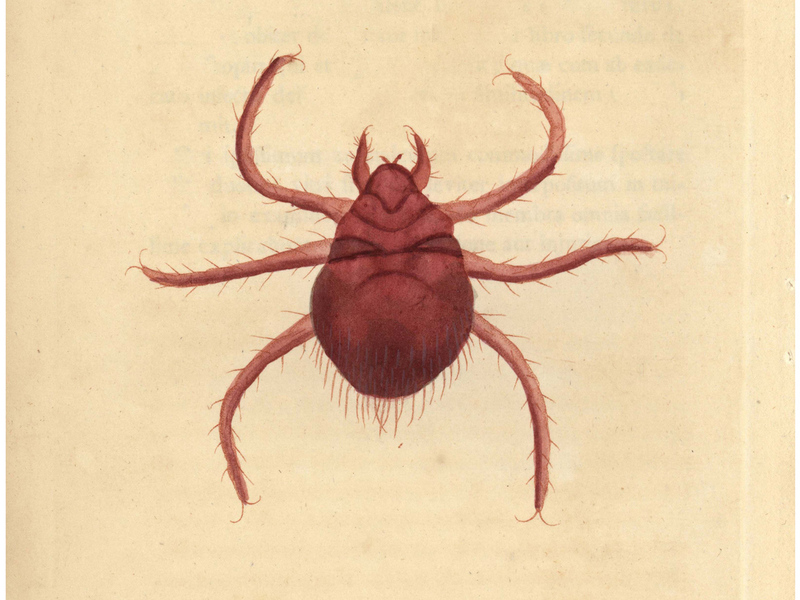 A hand-colored copperplate engraving from 1790, depicting a chigger. Nobody wants to be attacked by a chigger. These six-legged mite larvae — so small they're invisible to the naked eye — have a powerful bite that causes severe itching. They also transmit a disease called scrub typhus, named for the forest undergrowth, or scrub, that is home to the chiggers. Up until now, scrub typhus has been a regional problem. The chiggers, officially called Orientia tsutsugamushi, that spread that disease were thought to live in East and Southeast Asia as well as Northern Australia. The countries where scrub typhus shows up, including Pakistan and parts of Russia, form a long and wide geographic area called "the tsutsugamushi triangle." Within that triangle, when people come to clinics with complaints of rash, headache, high fever and muscle pain, scrub typhus is on the radar screen of possible diagnoses. With the correct diagnosis, the illness is highly treatable. But now scrub typhus has made an appearance in the Western hemisphere: Three patients were diagnosed between January 2015 and February 2016 in Chiloe Island off the coast of southern Chile, almost 7,500 miles away from where the disease is typically found. "It's a big surprise," says Dr. David Walker, pathologist and director of the Center for Biodefense and Emerging Infectious Diseases at the University of Texas Medical Branch in Galveston. Discovering scrub typhus in Chile, of course, has implications for the people in the rural area where it turned up. "But it also has global significance," says Dr. Thomas Weitzel, an author of a study in the Sept. 8 issue of the New England Journal of Medicine. "It means it might also exist in other countries in South America or even in Africa," says Weitzel. "Worldwide, we have to rewrite all the chapters of this disease and think wider." It's not an easy disease to diagnose. The symptoms of scrub typhus are similar to those of many other diseases, including malaria or dengue fever. To confirm a case of scrub typhus, health workers need technology to examine genetic material — technology that many developing countries don't have. Or else they must look for antibodies in the patient after the acute symptoms have passed. So making a diagnosis often means acting on a clinical suspicion of scrub typhus and treating accordingly, says Weitzel. Misdiagnosis can mean the wrong treatment. The disease is thought to kill 140,000 patients a year, often due to misdiagnosis. The cause of death is pneumonia or heart problems. In Chile or other countries outside the scrub typhus triangle, health care workers attempting to diagnose a disease with common symptoms like fever, rash and headache might well consider an unknown infection for which the first line of treatment would most likely be penicillin, says Weitzel. The problem is, penicillin is ineffective against scrub typhus. Doxlycycline is the antibiotic that knocks out the disease. "Patients get better within one or two days," says Weitzel. So how did this disease suddenly show up in Chile? "Could this mite be transported all the way from Asia to Chile?" says Walker, who wrote an accompanying NEJM paper titled "Scrub Typhus — Scientific Neglect, Ever Widening Impact." No one knows. Maybe it was in South America all along, he says, but people in the poor, rural areas where it strikes have long been incorrectly diagnosed. What scientists know is that it didn't travel the same way as some other diseases — Zika virus, for example. A patient infected with Zika can get on an airplane and fly from, say, Brazil to Puerto Rico. A mosquito in Puerto Rico can bite the Zika patient, then bite a healthy person and spread the virus. Not so with the chiggers that spread scrub typhus. The disease lives in the tiny mites, and they pass it on to their offspring, generation after generation, infecting the people that they bite. So it's the chigger, a tiny mite that is an arachnid, not an insect, that has to travel to new areas, not infected humans. Not many people study this disease, says Walker. And now, one of the few things people thought they knew — that scrub typhus is confined to a triangular shaped area from Pakistan to Russia to Australia — is wrong. "We have to rethink this," says Weitzel.